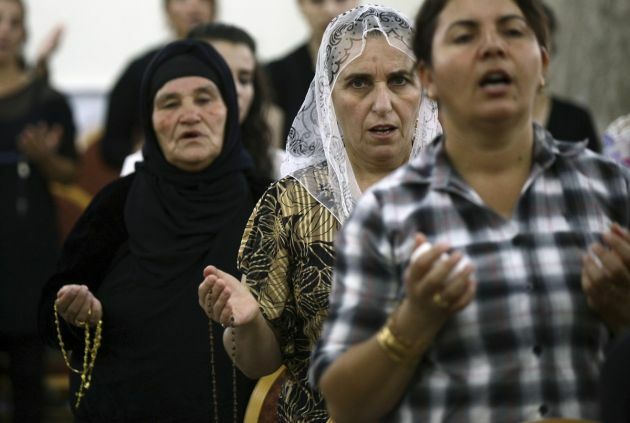 (Photo: REUTERS / Stringer)Iraqi Christians fleeing the violence in the Iraqi city of Mosul, pray at the Mar Afram church at the town of Qaraqush in the province of Nineveh, July 19, 2014. The ancient Christian community of the northern Iraqi city of Mosul had all but fled by Saturday, ending a presence stretching back nearly two millennia after radical Islamists set them a midday deadline to submit to Islamic rule or leave. The ultimatum by the Islamic State drove out the few hundred Christians who had stayed on when the group's hardline Sunni Muslim fighters overran Mosul a month ago, threatening Christians and the diverse city's other religious communities. Iraq's current situation is a "tragedy for many", both Christians and Muslims, and deeply worrying says the World Council of Churches general secretary, Rev. Olav Fyske Tveit. "It is with great sorrow that we see the apparent ending of a Christian presence in Mosul, present there since the earliest centuries of Christianity," said Tveit in a statement Monday. Citing the departure of Mosul's Christian population he asked for prayer for of Iraq's people, particularly "those from minority communities, both Christian and Muslim, who have been forced to leave their homes." Tveit said the WCC has received credible reports during recent days suggest that virtually the entire Christian community of Mosul has now left the city. The WCC urged, "the Iraqi authorities and encourages non-military international support for the initiation of an inclusive political process to strengthen fundamental human rights." This applies "in particular with regards to religious freedom, to urgently establish the rule of law and to ensure equal rights for all citizens." The Christians have been "forced into this decision through the actions of the self-described 'Islamic State', (formerly known as ISIS)," said Tveit. Christians were told they by those controlling Mosul that they had until last weekend to either, convert to Islam, pay a Jizya (poll tax for non-Muslims) or leave the city taking only their clothes with them. Failure to convert, or leave would result in their execution by the local government Christians were told. The WCC statement noted that a considerable number of Muslims, particularly from the Shia community, are also feeling compelled to depart. Christian refugees are taking temporary refuge in neighboring monasteries and villages and some have sought refuge in the Kurdish region of Iraq. On July 17, Patriarch Louis Raphael Sako, the Chaldean Catholic Patriarch of Baghdad, issued an appeal to the wider world. In it he set out in detail the impossible situation with which the Christian community in Mosul are now confronted. "In recent days, there has been written the letter 'N' in Arabic on the front wall of Christian homes, signifying 'Nazara' (Christian), and on the front wall of Shiite homes, the letter 'R' signifying 'Rwafidh' (rejecters),"' Patriarch Sako said. Tveit said, "Such a development has very sinister echoes. "Patriarch Sako's appeal rightly states that the developments in Mosul contravene 'the regulation of Islamic thought which is expressed in the Qur'an.'" The patriarch also drew attention to the long history of positive co-existence between Christians and Muslims in Iraq and in the wider Middle East. "Mindful of Patriarch Sako's words, I want to join with others in emphasizing how disturbing - and tragic - we find such developments," said Tveit. He noted that the WCC's main governing body, its central committee, meeting in Geneva earlier in July, issued a statement stressing the WCC's "great concern" over these "tragic developments of the situation in Iraq." Tveit said he wanted to emphasize that the WCC "affirms the role of the churches in Iraq and the region who are committed to engage in constructive dialogue with other religious and ethnic communities so that the pluralistic heritage of their societies is protected and secured. "The WCC assures those churches of the wide ecumenical support of such a process."